Lavender and coriander may at first seem like opposites. Coriander’s popularity in gin is as old as the spirit itself, featuring in gins like Gordon’s, Beefeater and Plymouth. Coriander’s rate of inclusion in gin is second to only juniper. On the other side, there’s lavender. Once a staple of soaps and perfumes such as Guerlain’s Jicky, has become one of the most popular botanicals in contemporary style gins. Its frequency of inclusion, especially in contemporary American distilled-gins has led some to call it ‘the quintessential American botanical’. As different as they may seem, they have much in common. But to see the similarities, we must start at the molecular level. Linalool is surprisingly one of the most important aroma molecules in gin. In 2005, an analysis published in the Journal of Agricultural and Food Chemistry found that in five of the six widely available gins, it was, by far, the most common volatile compound. Furthermore, linalool is found naturally in hundreds of herbs, leaves and flowers, including some of the most important gin botanicals: cinnamon, cassia, nutmeg and coriander, just to name a few. The human nose is incredibly sensitive to linalool. It is able to be detected at quantities as small as 4-10 parts per billion. It has even one more trick up its sleeve. Linalool is what chemists call a ‘chiral molecule’. This means that it has two forms that it takes in nature. As far as chemists are concerned, the two are identical. Both (R)-(-)-linalool and (S)-(+)-linalool have the same boiling point, the same solubility, and so on. However, insects, animals, humans and especially gin drinkers will notice that they smell completely different. The (-) version is sweetly floral with a touch of spice, compared by some to petitgrain. The (+) form is woody and is immediately recognisable to most as lavender. Lavender is a plant in the mint family, native to the Mediterranean region of Europe. Commercially speaking, there are several varieties of lavender which distillers have to choose from. The most common is Lavandula angustifolia, better known as English or Garden Lavender. There’s also Portuguese Lavender, French Lavender, and Spanish Lavender (confusingly also referred to as French Lavender). All lavenders are pronouncedly aromatic, with silvery, pointed leaves and spears topped with tight clusters of purple/pinkish flowers. The most aromatic lavender is harvested when the flower buds are on the cusp of opening. Though the whole plant contains the distinctive aroma, it’s usually only the buds that are used. English Lavender is the most archetypal, with a sweet, perfumed aroma heavy in (+)Linalool and Linalyl acetate – these two accounting for nearly 80 per cent of the volume of its essential oil. Other varieties are aromatically viable, but are often described as being more ‘camphorous’ than English, having a piney, minty and eucalyptus undertone. Because of this, varieties other than English are rare in culinary and gin distillation. While hardier than other floral herbs, distillers often opt for more delicate treatment of lavender. Too much heat applied and lavender can give off a ‘cooked’ or ‘stewed’ taste. Therefore, when distilling, many include lavender in a gin basket, or add it at the last possible minute. Some distillers have taken another approach to avoid heating the lavender at all whatsoever. Lee Spirits Company of Colorado and Maryland’s Springfield Manor Winery and Distillery both infuse lavender in a finished gin and then filter out the flower matter before bottling. While these infused gins have a golden-to-brown hue, both present a side of lavender that’s just not possible through distillation alone. Lavender in gin is often used sparingly as part of a botanical blend. Too much, and it can taste soapy or invite comparisons to the once fashionable soliflore perfumes. Judicious use of lavender imparts a mildly floral and sometimes sweet violet tinged note that compliments and often softens some of a gin’s resinous and piney character. Gins featuring lavender: Cotswolds Dry Gin, Bulldog Gin, Brooklyn Gin, Waterloo Gin, Candy Manor Gin, Hana Gin. Gins featuring lavender as a signature botanical: Lee Spirits Lavender Gin, Masons Dry Yorkshire Gin Lavender Edition, Amethyst Handcrafted Lavender Gin, Springfield Manor Lavender Gin. Coriandrum sativum is a member of the Apiaceae family whose denizens include other gin staples such as angelica, dill, fennel, anise and caraway. Native to almost all of Eurasia, the plant is an important part of several food cultures. It’s a herb like plant rarely exceeding 50cm in height. Floppy bunches of broad green leaves topped with umbels of whitish flowers which bear small tan coloured fruits the size of a peppercorn. Though the leaves can be delicious, when we talk about coriander in gin, we are only talking about the seeds. 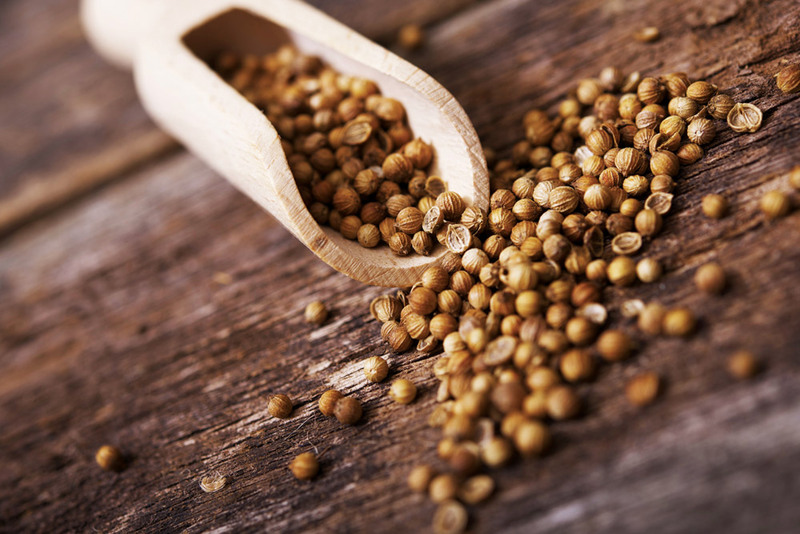 Coriander seeds are grown widely around the world with major commercial supplies available from India, Morocco, Canada, Pakistan and Bulgaria – just to name a few. All coriander prominently features (-)linalool as its primary aromatic component, and it usually makes up around 75 per cent of what you smell when you get a whiff of coriander essential oil. In smaller amounts, there’s also camphor, terpinene and α-Pinene, the latter of which is the primary volatile in juniper. The flavour of coriander in gin is often described as somewhere between citrusy, spicy, and slightly peppery. Opihr, Gin No 3, Citadelle and Greenall’s for example. Which is surprising given that Moroccan juniper is regarded as having a much lower essential oil content, meaning it takes more seeds to get the desired flavour. Wetter, cooler climates generally produce smaller seeds, which have a much higher essential oil content. It’s no coincidence that aromatherapists highly value Norwegian juniper with its 1.4-1.7 per cent essential oil yield. No matter where you source your coriander, one thing is clear, coriander has been an essential part of the gin botanical accord dating back to gin’s Dutch origins. Though a minor part of Dutch culinary culture overall, coriander as a key ingredient in mulled wines dating as far back as Een notabel boecxken van cokeryen (roughly translated as ‘A remarkable little cookbook’) in 1514. Similar spice mixtures to those used for these spiced wines, including coriander would be found in 16th and 17th-century Genever recipes along with juniper, which in turn influenced early gin botanical bills, including 1769’s Gordon’s Gin. In short, coriander’s popularity with gin distillers is nearly three centuries strong, and shows no signs of abating anytime soon. Gins featuring coriander (with date of launch): Gordon’s Gin (1769), Plymouth Gin (1793), Tanqueray (1830), Seagram’s Dry Gin (1857), Beefeater (1876), Bombay Sapphire (1987), Citadelle Gin (1994), Aviation Gin (2006), Roku Gin (2017).